The Provisional Legislature held session mainly in Oregon City. They met at different times each year, and in 1848 they did not meet; too many members had left for the California gold fields. The legislature enacted various laws, sent memorials to Congress, incorporated towns and organizations, and granted divorces and licenses to run ferries. After the establishment of the Oregon Territory, the legislature was replaced with the two house Oregon Territorial Legislature. Other government positions included Recorder, Treasurer, Attorney, and Sheriff. The recorder position would later become the position of Secretary of State. In 1844, the legislature passed a law banning the sale of ardent spirits, out of concern that the Native Americans would become hostile if intoxicated. ^ a b c d e f g h i j Brown, J. Henry (1892). Brown's Political History of Oregon: Provisional Government. Portland: Wiley B. Allen. LCCN rc01000356. OCLC 422191413. ^ a b c d e f g Bancroft, Hubert and Frances Fuller Victor. History of Oregon. Archived 2015-01-31 at the Wayback Machine Vol. 1. San Francisco: History Co., 1890. ^ Johnson, Overton; Winter, William H. (1846). Route across the Rocky Mountains with a Description of Oregon and California . as reproduced in the Oregon Historical Quarterly, 1906. ^ a b c d e f g h i j k Corning, Howard M. Dictionary of Oregon History. Binfords & Mort Publishing, 1956. ^ Memorial of Legislative Assembly of Oregon Territory relative to their present situation and wants. in Miscellaneous Documents Printed by Order of the House of Representatives, during the First Session of the Thirtieth Congress... Vol. 1. Washington: Tippin & Streeper, 1848. p. 5. ^ a b "Beginnings of Self-Government". The End of the Oregon Trail Interpretive Center. Archived from the original on 2007-02-10. Retrieved 2007-03-14. ^ a b c d e f Gray, William H. (1870). A History of Oregon, 1792-1849, Drawn from personal observation and authentic information. Portland: Harris & Holman. ^ a b "Oregon Supreme Court Justices". Oregon Blue Book. Oregon Secretary of State. Retrieved 2007-03-16. ^ a b c Clark, Robert C. (June 1912). "How British and American Subjects Unite in a Common Government for Oregon Territory in 1844". The Quarterly of the Oregon Historical Society. 13 (2): 140&#45, 159. JSTOR 20609901. ^ a b Holman, Frederick V. (1912). 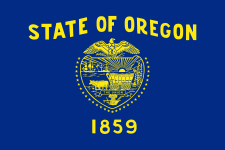 "A brief history of the Oregon Provisional Government and what caused its formation". The Quarterly of the Oregon Historical Society. 13 (2): 89&#45, 139. ^ a b c d e Oregon Territorial Government. Laws of a General and Local Nature passed by the Legislative Committee and Legislative Assembly. Salem, OR: Asahel Bush. 1853. ^ Dobbs, Caroline C. (1932). Men of Champoeg: A Record of the Lives of the Pioneers Who Founded the Oregon Government. Metropolitan Press. ^ Bancroft, Hubert Howe; Victor, Frances Fuller (1886). History of Oregon Vols.1-2. The Works of Hubert Howe Bancroft. San Francisco, California: History Company. ^ Bradley, Mari M. (1908). "Political Beginnings in Oregon. The Period of the Provisional Government, 1839–1849". The Quarterly of the Oregon Historical Society. 9 (1): 42&#45, 72. JSTOR 20609761. ^ Mcclintock, Thomas C. (1995-01-01). "James Saules, Peter Burnett, and the Oregon Black Exclusion Law of June 1844". The Pacific Northwest Quarterly. 86 (3): 121–130. doi: 10.2307/40491550. JSTOR 40491550. ^ Oregon Acts and Laws New York City: N. A. Phemister Co.
Hubert Howe Bancroft, History of Oregon: Volume 1, 1834-1848. San Francisco, CA: The History Company, 1886. J. Henry Brown, Brown's Political History of Oregon: Provisional Government: Treaties, Conventions, and Diplomatic Correspondence on the Boundary Question; Historical Introduction of the Explorations on the Pacific Coast; History of the Provisional Government from Year to Year, with Election Returns and Official Reports; History of the Cayuse War, with Original Documents. Portland, OR: Wiley B. Allen, 1892. J. Quinn Thornton, "History of the Provisional Government of Oregon," from Constitution and Quotations from the Register of the Oregon Pioneer Association, Together with the Annual Address of Hon. S.F. Chadwick, Remarks of Gov. L.F. Grover, at Reunion, June 1874, and Other Matters of Interest. Salem, OR: E.M. Waite, 1875; pp. 43–96.